L emurian Star Seeds are considered one of the master crystals, reminding us that while we are all individuals, we are also connected to each other, and that we are all equal in spirit. Originally found in Brazil, Metaphysical legend states that there was once an advanced ancient civilization called ‘Lemuria’ which were similar to Atlantis but more spiritually developed and peaceful, the Lemurians programmed these crystals to teach their message of oneness and healing. These crystals were found centuries later by us. Legend also states that the crystals were planted in a grid pattern over the surface of the earth and beyond, to the other stars and dimensions. When you connect to a Lemurian crystal and the energy it contains, you are also connecting to this grid of associated energies from the earth, the stars and beyond. Were first discovered on the Serra do Cabral in Minas Gerais, Brazil. Recognized by parallel grooves that run along alternating sides, they are believed to be programed with spiritual information and wisdom from the ancient Lemurian Culture. Clear Lemurians bring guidance and clarity to one’s spiritual path. Lemurian Goddess Crystals are clear to slightly smoky, and may have a white or earth tone phantom layer one or more faces. They bring the mind and body into balance with the nurturing qualities of the earth, and give access to Lemurian goddess wisdom. Lemurian Dream Quartz contains phantoms ranging in color from creamy white to pale green, and integrate spiritual dreams and awareness into the realities of earthly life. They easily elevate thoughts to access Lemurian wisdom from higher planes. Lemurian Healers contain green chlorite phantoms. They can be used alone or in combination with other healing crystals to strengthen the immune and circulatory systems, increase energy, and promote well being. Lemurian Golden Healers have a thin coating of golden colored Iron, and are wonderful for all types of healing work, and especially with feelings and emotions. Carneros Lemurians come from the Carneros Lemurian Mine, and are very powerful and energetic. They activate the crown chakra, and facilitate connection with the higher mind, the ability to focus, and clarity of intention. Super Pink Lemurians are one of the newest and very rarest varieties of Lumurian Seed Crystals, that came from a small pocket discovered in late 2009. Partially covered by a thin layer of oxidized iron (Hematite), which readily flakes off, these crystal have an additional layer of very, very unusual, captivating, and intriguing surface markings. 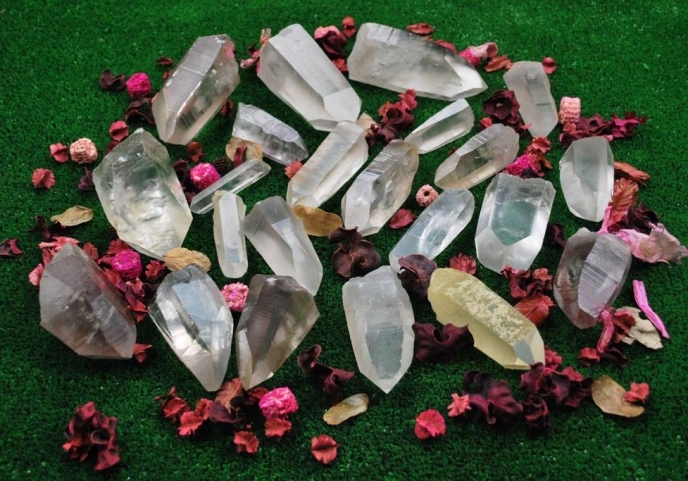 They add a whole new and very advanced level to Lemurian Crystal wisdom and information, that feels very fresh, profound, and mind expanding, on top of a strong, heart center foundation. Tangerine Lemurians are the ultimate second chakra crystals, strengthening passion and desire, and connecting them with one’s spiritual aspirations.